Planning your funeral can seem like a bit of a minefield with all the different options available, and a lot of people are worried about burdening their next of kin when the time finally comes. Purchasing a funeral plan could take away some of the stress at a difficult time, but it’s important that you know that your money is safe as well. The Funeral Planning Authority was established in 2002 in an effort to offer some regulation to the industry by providing a set of rules and a code of conduct to participating companies. However, it’s voluntary for organisations to join, so whilst 95% of funeral planning businesses are registered with them, it’s worth making sure before you start handing over your money. It’s easy to get confused between funeral plans and funeral insurance (offered as part of some over-50s life insurance plans), but both are quite different, so it’s important to research the options and choose the right package for you. A funeral plan is a fixed amount of money and you can choose whether to pay for it in a lump sum or in instalments, but the final figure won’t change. The figure is based on the basic funeral costs at the time of purchase, so even if the cost of those increases in future, you will still be covered for the package you’ve purchased, as the funeral director services are protected against inflation. Typically, your money will either be invested into a trust fund with trustees, or into an insurance policy through the plan provider, but either way it will be enough to cover the costs of the funeral package you originally paid for. In most cases, you can only purchase funeral insurance once you are over 50, and depending on the plan, you are committed to paying your instalments until you die, or reach 80 or 90 years of age. This means you could end up paying over the odds for funeral costs if you live a long life, and so these insurance plans often offer poor value for money. An alternative option to purchasing a funeral plan or insurance policy is to set aside some money in a savings account, and let your next of kin know where to find it when it’s needed. The advantage of this is that you’re earning interest on your savings, but there’s no guarantee this will increase in line with inflation on funeral costs. It also means your recently bereaved family and friends are now responsible for sourcing all the necessary arrangements, whilst this service would usually be included through the chosen funeral director if you chose an FPA-regulated funeral plan. Whilst it is possible to claim funeral expenses from the estate, you could also find that these savings are subject to inheritance tax if the value of your estate takes you over the threshold. An ISA can be passed tax-free to a spouse or civil partner, but unfortunately will be subject to tax if passed to your children. Your personal financial circumstances and those of your family must also be considered. Money held in a funeral plan does not count towards your capital when being assessed for certain state benefits, but if you cannot afford the lump sum or instalments, a savings account may be a better option, bearing in mind that any additional costs will be passed on to your next of kin at the time of need. However, if your next of kin is also in receipt of certain government benefits, they may be able to claim assistance with your funeral costs from the DWP if that is considered to be the only option. Whilst the FPA offer a baseline for regulating funeral plans, there are still vast differences between them and different packages available. The average funeral in 2018 cost between £3000-£4500. As a guideline, the basic cover would include the services of a funeral director, care of the body, a coffin and hearse, transport of the body to the funeral home, and visiting the body in a chapel of rest. 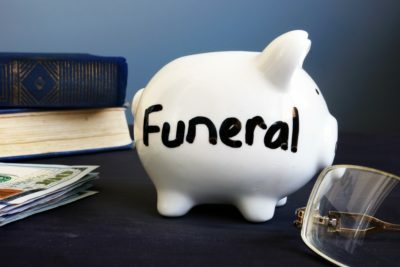 Beyond these, there will be a range of discretionary costs, such as embalming, transport for mourners, or crematorium fees, which will be the financial responsibility of your next of kin to provide unless you choose a plan that includes them. Other costs that are typically not included in a funeral plan might include memorial, death, or funeral notices, order of service cards, burial fees, or headstones. Every plan is different, and some plans are tied to specific local areas or specific funeral directors, so it’s important to check what’s included in each one, and that the provider is registered with the Funeral Planning Authority to ensure you are protected.